Fermented food can be produced with inexpensive ingredients and simple techniques and makes a significant contribution to the human diet, especially in rural households and village communities worldwide. Progress in the biological and microbiological sciences involved in the manufacture of these foods has led to commercialization and heightened interest among scientists and food processors. 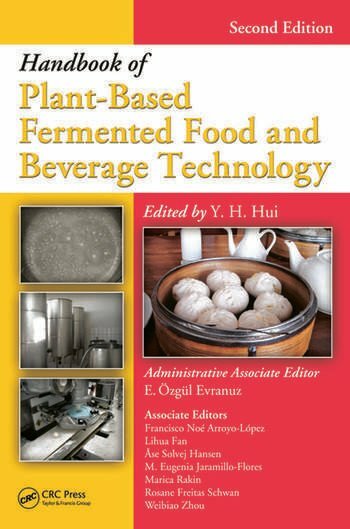 Handbook of Plant-Based Fermented Food and Beverage Technology, Second Edition is an up-to-date reference exploring the history, microorganisms, quality assurance, and manufacture of fermented food products derived from plant sources. Fermented food products play a critical role in cultural identity, local economy, and gastronomical delight. With contributions from over 60 experts from more than 20 countries, the book is an essential reference distilling the most critical information on this food sector. Y. H. Hui received his Ph.D. degree from the University of California at Berkeley. He is currently a senior scientist with the consulting firm of Science Technology System in West Sacramento, California. He has authored, coauthored, edited, or coedited more than 30 books in food science, food technology, food engineering, and food laws, including Handbook of Food Product Manufacturing and Handbook of Food Science, Technology, and Engineering. He has guest-lectured in universities in North, Central, and South America as well as Europe, and Asia and is currently a consultant for the food industries, with an emphasis on food sanitation and food safety. E. Özgül Evranuz is a professor (1994–present) of food processing at the Food Engineering Department of Istanbul Technical University (ITU), Turkey. After graduating from the Chemical Engineering Department of Middle East Technical University (METU, 1971) in Ankara, Turkey, she began her academic career in the area of food technology. She holds M.S. degrees in chemical engineering (METU) and food science and management (University of London, Queen Elizabeth College) and a Ph.D. degree in chemical engineering (ITU). She is one of the founders of the Food Engineering Department of ITU. Her main interests are preservation, storage, and packaging of food plant materials. She has served as a book editor and has several publications in the field.